Fatty acid metabolism is an essential process in tumor growth and proliferation. Despite attempts to block fatty acid metabolism as a therapeutic strategy to reduce tumor size and growth, the outcome has not always been positive. Researchers from the lab of Prof. Sarah-Maria Fendt at the VIB-KU Leuven Center for Cancer Biology have now demonstrated that certain tumor cells use a previously unexplored alternative pathway to produce fatty acids. This finding can explain the resistance of particular cancer types to fatty acid metabolism inhibition. It is essential to gain more insights into this process to develop novel therapeutic strategies. The results are published in the renowned journal Nature. 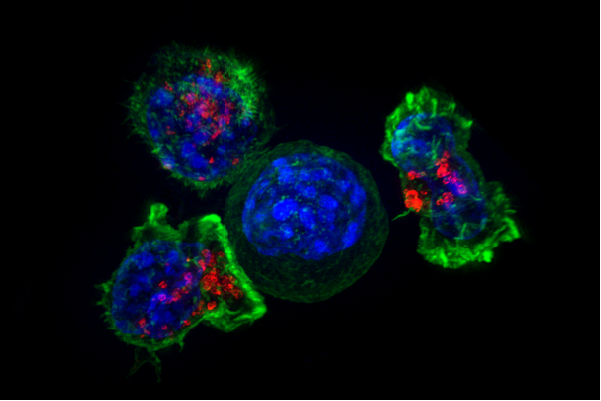 Tumors grow and proliferate, and to do so, cancer cells require the duplication of building block molecules. This includes nucleotides to make DNA, but also fatty acids to make the cell boundaries, i.e., the cell membrane. Not surprisingly, many cancer cells have upregulated metabolic reactions that lead to increased nucleotide and fatty acid production. Current therapies focus on the inhibition of nucleotide and fatty acid generation to block tumor growth. This strategy has proven to be successful in the case of nucleotide metabolism: chemotherapeutic agents currently used in cancer treatment, such as 5FU and methotrexate, inhibit tumor growth by targeting nucleotide generation. However, this has limited success for fatty acid metabolism inhibition. Kim Vriens, Stefan Christen and colleagues in the lab of Sarah-Maria Fendt (VIB-KU Leuven) explored why many cancer cells are resistant to the inhibition of fatty acid metabolism, and particularly to the inhibition of the enzyme stearoyl-CoA desaturase (SCD). This enzyme has always been considered the only source of newly produced mono-unsaturated fatty acids, which are required for membrane generation. However, the researchers now report that some cancer cells exploit an unusual metabolic pathway to produce mono-unsaturated fatty acids. This pathway, novel in cancer cells, requires the enzyme fatty acid desaturase (FADS2) and results in the production of the unusual fatty acid sapienate. The presence of this novel and alternative metabolic pathway was identified in isolated cancer cells and in lung and liver tumors samples from mice and human patients. Prof. Sarah-Maria Fendt (VIB-KU Leuven Center for Cancer Biology) said, "The newly discovered sapienate metabolism constitutes an alternative route for cancer cells to process the fatty acids required for membrane synthesis. These findings can explain the resistance of many cancer types to the inhibition of fatty acid desaturation. Since fatty acids are essential for tumor growth, we expect that further dissection of the sapienate metabolism pathway will lead to a better understanding of how cancer cells grow and will thus open new avenues to better target this deadly disease. Moreover, this exciting discovery was supported by a fruitful collaboration between basic scientists and clinicians across three continents."